The name's Craig, Daniel 'Wroughton' Craig! The latest James Bond film has just been released - SPECTRE. It's the 24th outing for 007 since the very first Bond movie hit our screens starring Sean Connery in Dr No way back in 1962. 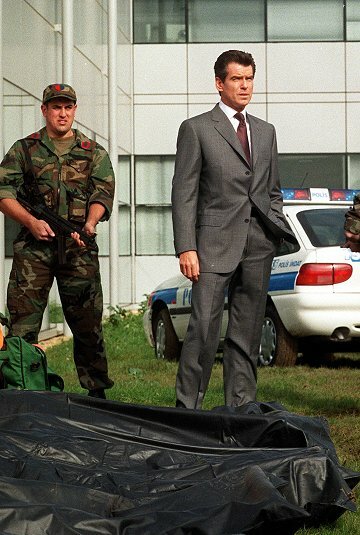 Alas, it doesn't look like it features a Swindon backdrop as actor Daniel Craig battles to save the world. Let's face it. 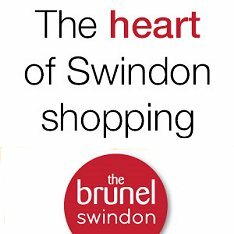 You wouldn't normally associate the glitz, the glamour and the girls of the world of James Bond with Swindon, would you? No way. Indeed, what can the exciting exploits of the planet's most famous spy possibly have in common with a town hardly the number one hang-out for international playboys? But that is exactly where people can get the wrong impression of Swindon. It is in fact one of his favourite film locations and the former home of 007's creator himself. And... amongst other connections, we've even got a pub uniquely named after one of his most famous novels and movies - and a familiar Swindon face who produced one of the most popular Bond movie theme tunes ever. James Bond and Swindon, we'll definitely raise a drink (martini - shaken, not stirred) to that! 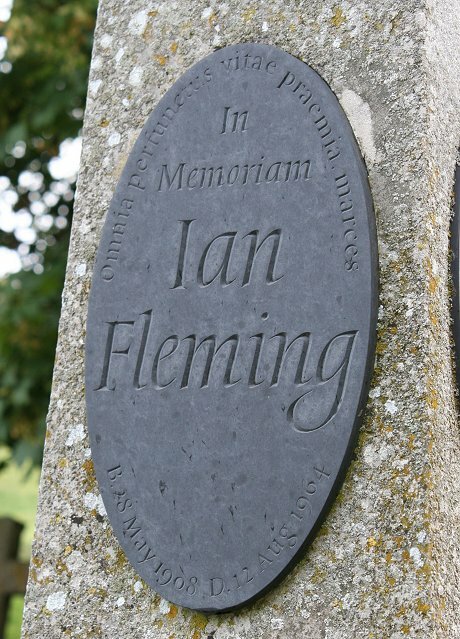 Most famously, the author of the James Bond novels on which the films are based, Ian Fleming (pictured, above right), lived in the Swindon in the small village of Sevenhampton, just five miles outside the town, where he owned the manor, Warneford Place for many years. One of the final James Bond adventures he penned is the latest 007 blockbuster Quantum of Solace, just two years before he died in 1964. 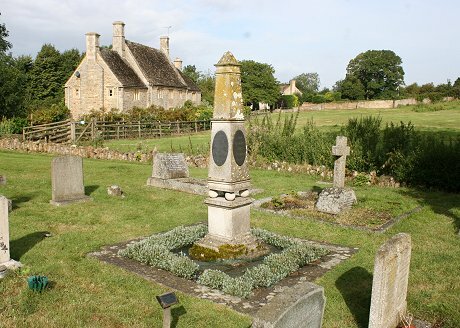 Fleming is buried in Swindon at St. James's church, just yards from his former home (see picture). Click on the Fleming link, below, for the full story. 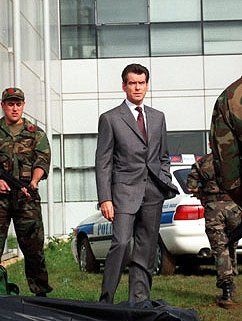 Film-wise, Swindon's connections go even further - and there aren't many towns that can boast they've been used as a location set for a James Bond film - not once but twice! 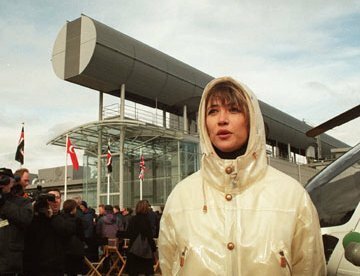 Most recently, the town played host in March 2000 to filming of the 19th 007 movie 'The World is Not Enough' with Pierce Brosnan (James Bond), Dame Judi Dench (M) and female lead Sophie Marceau (Elecktra King) using the futuristic Motorola factory at Groundwell as a double for a high tech oil pumping station. 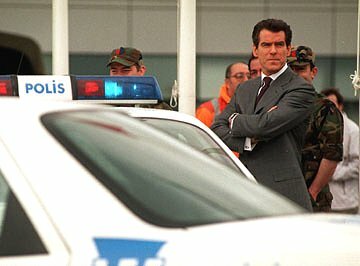 Over 170 actors and film crew descended on the Motorola factory for just a few days filming with Pierce Brosnan staying at the nearby Chiseldon House Hotel and even seen enjoying a pint of Arkells 3B's at the nearby Plough Inn! 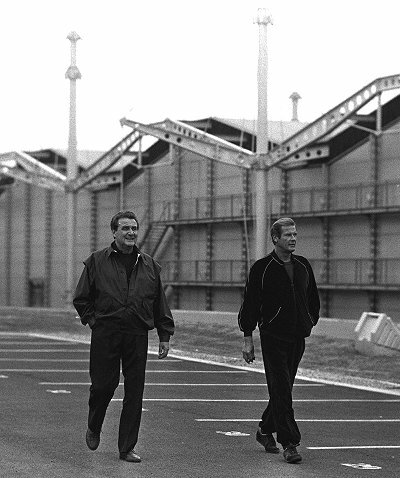 But the first time Swindon was 'shaken and stirred' by the presence of James Bond was when the award-winning Renault building was used for filming 'A View to a Kill' in 1984. This, the 14th 007 movie, used this futuristic parts distribution warehouse for filming a series of scenes featuring James Bond (Roger Moore) and Patrick MacNee (Sir Godfrey Tibbett) as they try to stop their arch enemy Max Zorin (Christopher Walken) from destroying the world - nothing new there then! 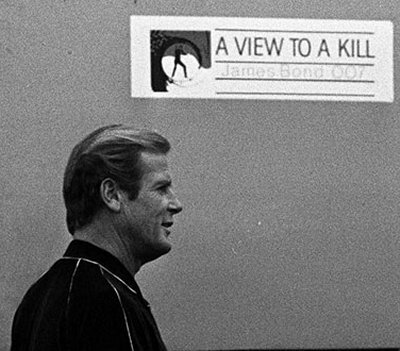 'A View to a Kill' was Roger Moore's seventh and last Bond film but unfortunately you won't recognise him as being in Swindon if you see the film, because all the scenes shot at the Renault building were actually inside. 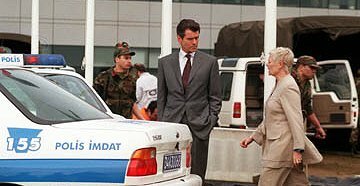 Incredibly, the connection with Swindon and 'A View to a Kill' also extends to one of James Bond's leading ladies in the movie as well - Russian spy Pola Ivanova. A character played by well-known actress Fiona Fullerton, who can be seen very often shopping in and around Swindon - most regularly in Highworth high street - as she lives in nearby Kempsford. And has done for many years since turning her career to becoming a successful property developer. No Bond film would also be complete without a thumpingly good theme tune and an explosive soundtrack to build up the atmosphere. 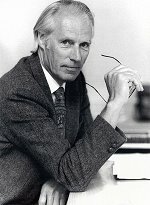 And Swindon has a connection to this as well through world famous record producer - the late Sir George Martin. The man often described as the 'fifth' Beatle, called in by Paul McCartney to help write - then arrange and produce - the theme tune for the 007 classic 'Live and Let Die' in 1973. Martin was also asked to score, orchestrate and conduct the whole soundtrack for the film which featured Roger Moore in his first outing as James Bond. 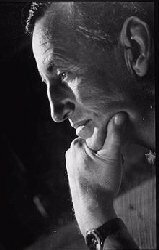 Sir George was considered the only man capable of taking over from the legendary John Barry, who until that time had written and produced every Bond song and soundtrack in the series - except one - Goldfinger, which was produced by Martin. As we all know, JB enjoys a drink or two, so in Swindon's unlikely connection with 007 comes the real piece de la resistance - the only pub in the world called The Goldfinger. A place unfortunately more likely to serve real ale and bar meals than martinis - shaken not stirred. Opened by Ian Fleming's widow, Ann, in 1971, the 'Goldie' as it's known amongst residents in Highworth where it stands in Newburgh Place, is named after probably the most famous all of the Bond books and films. The original pub sign used to feature the recognisable silhouette of 007 himself, but after various changes of landlord over the years - and a much-needed total refurbishment in April 2008 (coinciding with the 100th anniversary of Fleming's birth - see link below) - it continues to hold a unique place in pub-naming history and as the odd stop-off for complete Bond buffs. Now here's a connection that's definitely got us wondering. Famous for saying the immortal words, 'The name's Bond, James Bond', 007 star Daniel Craig's full name is actually 'Daniel 'Wroughton' Craig'. His father and grandfather have the same middle name as well. 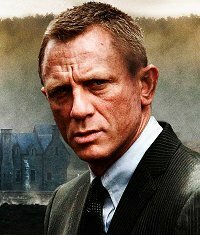 Quite why the current face of 007 was christened 'Wroughton' - with exactly the same spelling as the large village in Swindon - we don't yet know, but SwindonWeb's best agent is on it - and he has a lead! Our grateful thanks to Richard Wintle of Calyx Multimedia for his kind permission to reproduce a number of pictures that you see on these pages.